Raises over $190,000 for Arts Education in Schools! PRINCETON, NJ; April 18, 2016 — On Saturday, April 2, Young Audiences New Jersey & Eastern Pennsylvania (YA), the area’s largest arts education non-profit, celebrated with a special black tie gala, Dazzle: Mad Hot Ballroom, Anything Goes at the Princeton Hyatt. The benefit included a performance by students of YA’s Trenton Adopt-A-School initiative currently participating in a dance residency, and a dance competition a la “Dancing With the Stars” where VIP dancers were paired with professional dancers. Dazzle: Mad Hot Ballroom raised over $190,000 and all donations will support YA in its mission to inspire young people and expand their learning through the arts. The generous donations included $54,450 that was raised for YA’s Adopt-a-School Program in celebration of the initiatives 10th anniversary serving Trenton’s children. “The arts programs strengthen academic concepts, bring a diverse perspective to learning, encourage positive choices, build character, and promote hard work and student achievement,” shared Karen Baker an Art Teacher from Village Charter School that is part of YA’s Adopt-a-School Program. A highlight of the night, four VIP dancers, paired with professional dancers, competed for the disco ball trophy and included Lambertville resident, Carol Cronheim (New Jersey’s former Assistant Secretary of State), Trenton resident, Dan Fatton (Executive Director of the Work Environment Council), Princeton Junction resident, Stacy Mattia (Senior Vice President of OceanFirst Bank) and Michele Minter (Vice Provost for Institutional Equity and Diversity at Princeton University). 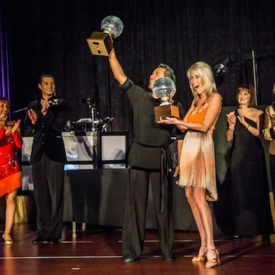 They all gave stellar dance performances and after a very close race, Stacy Mattia and professional dance partner from Fred Astaire Dance Studio, Juan Ramirez, garnered the coveted prize (and bragging rights) with their upbeat Latin dance routine. Carol Cronheim, Stacy Mattia, Dan Fatton and Michele Minter join the ranks of Dazzle VIP dancers from the past three years including: Barbara Coe, Chris Daggett, Denise Wood Darder, Sue Evans, Jill Jachera, Chris Long, Tamara Matteo, Bobby Mascia, Jon McConaughy, Katie Hughes Redmond, Jeff Perlman and Bryce Thompson. YA Trustee and Gala Co-Chair Liz Fillo expressed, “This kind of success comes when our extraordinary community works together to create opportunities for a great cause. For more information about Dazzle: Mad Hot Ballroom and to see pictures and performance videos from the evening go to www.DazzleYA.org. Dazzle: Mad Hot Ballroom IV received additional support from generous corporate sponsors, including Eisner Amper, Callaway Henderson Sotheby’s International Realty, Cohen, Seglias, Pallas, Greenhall & Furman, Drinker Biddle & Reath, Fred Astaire Dance Studio, M&T Bank, Mathematica Policy Research, Merrill Lynch, Princeton Area Community Foundation, Princeton BMW/MINI, Robert Wood Johnson University Hospital, UBS Voorhes Blitz Amerio Group, and Volvo of Princeton/Long Motor Company. Founded in 1973, Young Audiences New Jersey & Eastern Pennsylvania is the premier arts-in-education resource in the region, providing high-quality performances and artist-in-residence programs to nearly 700 schools each year. Young Audiences’ extensive professional artist roster represents all art forms—from dance and theater to music, language and visual arts. The organization annually reaches nearly 500,000 children pre-kindergarten through grade 12. This entry was posted in Press, Press Media, Press Releases on May 4, 2016 by Denyce.